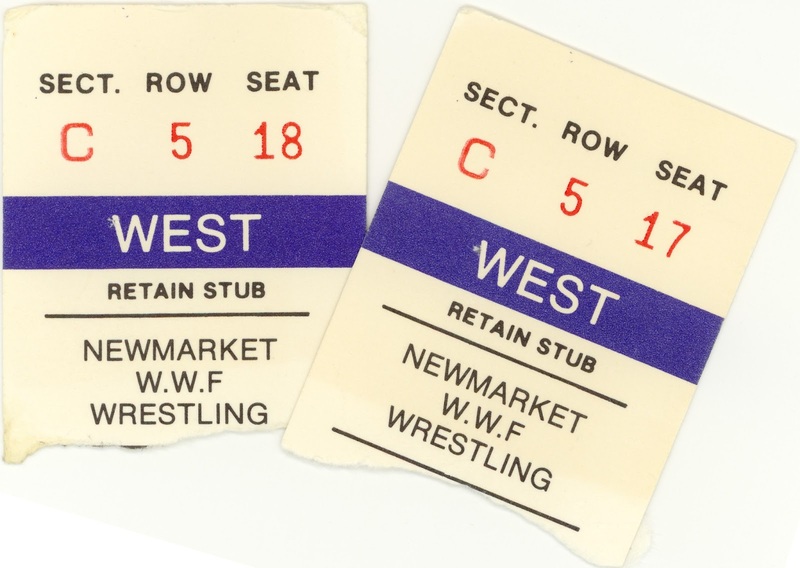 Wrestling in the Toronto area was white-hot with just days to go before the WWF's biggest event of all time, WrestleMania III. 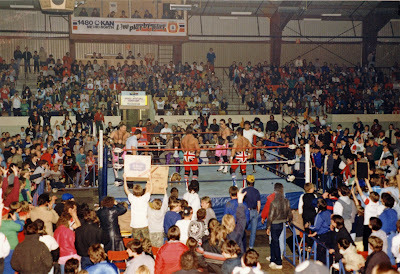 Maple Leaf Wrestling returned to my home town of Newmarket, Ontario. 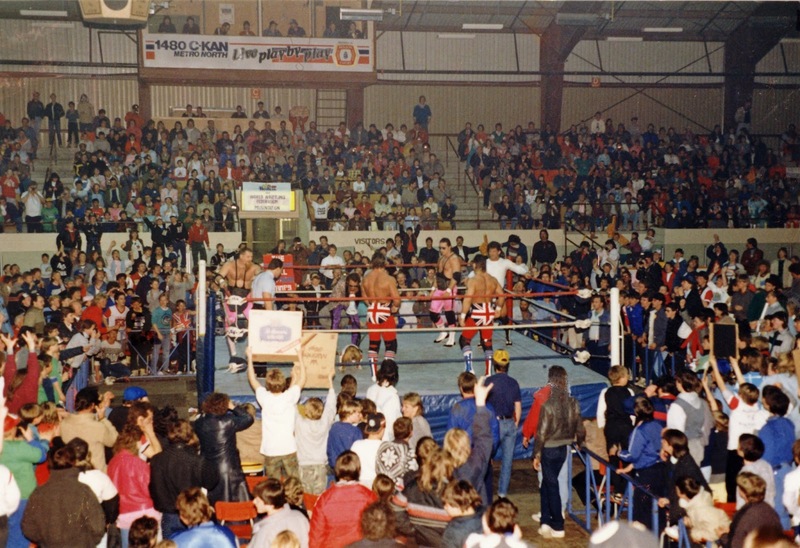 The Newmarket Recreation Complex was a small arena with room for about 3000 people. This show on March 17, 1987 was sold out and I had great seats with my dad. Roughly dead-centre, five rows back in the stands. And in the main event, my favourite tag team and new champions, Bret "Hit Man" Hart & Jim "Anvil" Neidhart with Jimmy Hart - The Hart Foundation - taking on Dynamite Kid and Davey Boy Smith, the British Bulldogs. The Bulldogs were accompanied to the ring by their mascot, Matilda the dog, who you see here being lectured to by Jimmy Hart through a megaphone. 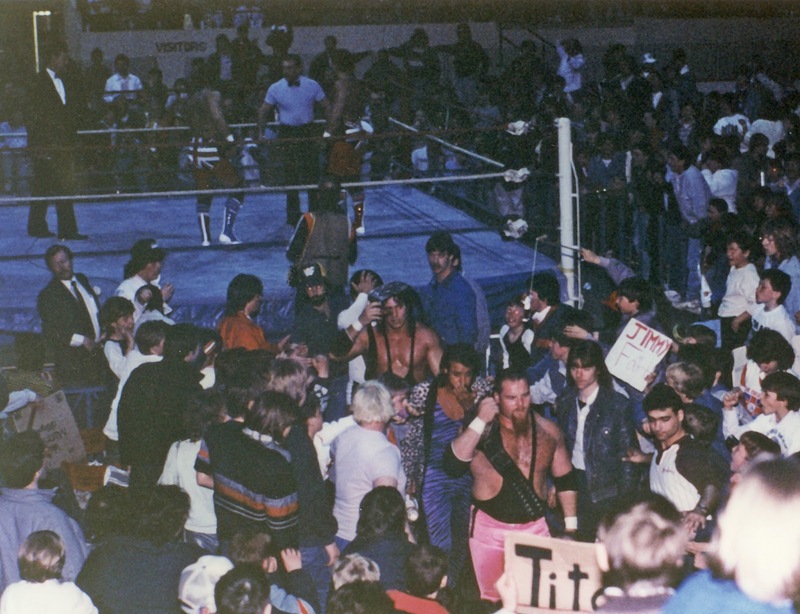 The Hart Foundation was accompanied to the ring by referee-turned-wrestler Danny Davis. The referee for this match was former wrestler John Bonello. In the background above the hallway you can see a sign for Hostess Potato Chips. Hostess was running a co-promotion with the WWF, packaging small wrestling stickers in bags of chips. I stuck them on the front of the photo album these pictures come from. You'll recognize the ring above as the same one I mentioned in my first posts on this blog, and also from the WWF TV tapings from 1985-1986 in Brantford, Ontario. The ring posts give it away. Dynamite Kid was still working hurt, so I think Davey Boy Smith took most of the bumps. 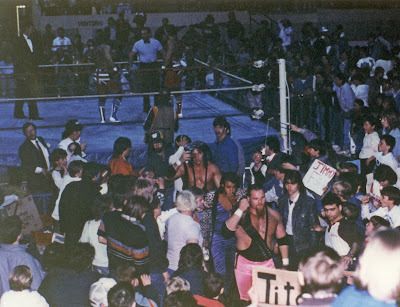 As you see above, the Hart Foundation retained the titles but took a beating, with Jimmy Hart and Danny Davis looking a little worse for wear as they headed to the dressing room. The WWF roster was working like crazy at this point in time. 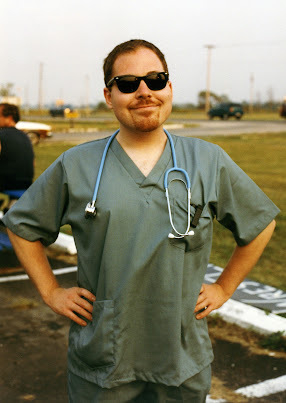 Legend has it that the crew rolled into WrestleMania exhausted and banged up. I'd love to hear from Jimmy Hart or anyone else on the card what it was like doing small shows like these with the biggest card in history a mere 12 days away. And if you look closely, that's a young, swarthy, Jimmy Korderas in the lower right, helping to clear the aisle for the heels. Before he was a referee, he was on the ring crew learning from guys like Bonello and Terry Yorkston.